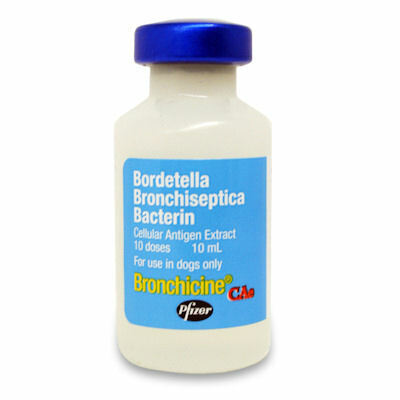 Bronchicine CAe (Zoetis) 10 dose vial of injectable kennel cough vaccine. Recommended for use as an aid in the control of Canine Infectious Tracheobronchitis (Kennel Cough) caused by the organism represented. How to use this injectable vaccine. Shake well, aseptically remove entire contents into the syringe. Push out any air trapped in the syringe. Administer 1 mL subcutaneously under loose skin (back of neck) to healthy dogs at least 8 weeks of age. Do not vaccinate into blood vessels. If blood enters the syringe choose another injection site. For initial vaccination a second dose is required 2-4 weeks later. This product should be administered by subcutaneous injection only. Annual revaccination with a single 1 mL dose is recommended. Vaccine shipments are only shipped Monday thru Wednesday. Wednesday orders must be received by 2:00 pm (Central Time) to be shipped that day, otherwise they will be shipped the following Monday. .
For use in dogs only, Syringes and needles are not included.